At Tahi Lodge you will be greeted with stunning sea and coastal views, smiles and a warm welcome from your hosts Warren & Lauren Kitchin. Only a one hour scenic drive north from Auckland to the beautiful Matakana Coast Wine Country Region and its picturesque rural/coastal setting - Tahi Lodge is situated at Snells Beach close to many activities and attractions. Tahi Lodge is ideal for relaxing short breaks, holidays with family and friends or celebrating special occasions such as birthdays, weddings or anniversaries. Extended stays can also be accommodated during off peak months (June-September). The property can host up to a total of six guests plus infants. The Kawau Apartment can host 4 guests and is a fully self contained Deluxe Apartment. The Matakana Suite can host 2 guests and is a Deluxe King Suite. Both have private entrances and our room tariffs include continental breakfast supplies. Additional services offered include room dressing for special occasions and picnic hampers to enjoy at our wonderful local beaches and reserves. You can also treat someone special or a prize winner to a Tahi Lodge gift voucher. Please contact us for available options. 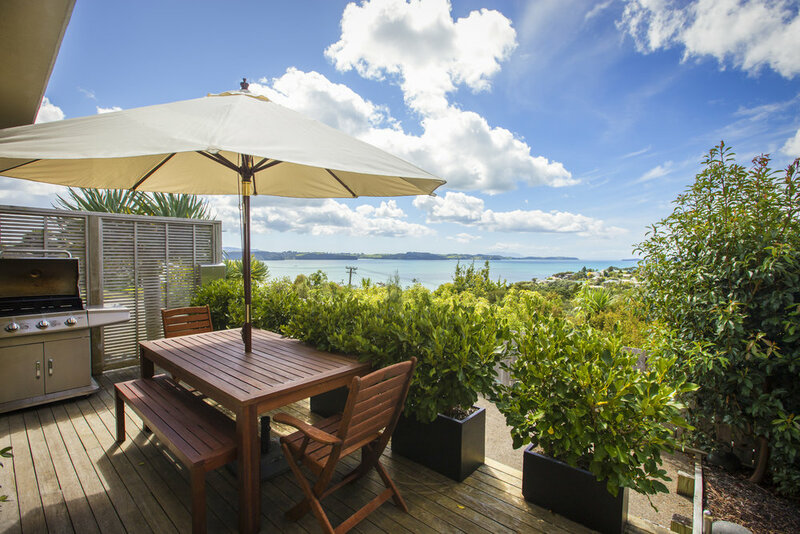 The Kawau Apartment is fully self-contained with private access/deck area and stunning sea views. It caters for up to four guests plus an infant offering full kitchen facilities and open plan lounge with Sky digital TV. The apartment has two bedrooms - the master has a king size bed and sliding door access to the deck area. The second bedroom has two king single beds which convert to a California super king bed. Continental breakfast provisions are supplied. Click here to view images of the Kawau Apartment Suite accommodation and facilities.